As you may know, Dr. Burkoski,RNAO's immediate past-president, was fired from her role as Chief Nursing Executive and Vice President of Professional Scholarly Practice at London Health Sciences Centre (LHSC) shortly after speaking out about RNAO’s report and concerns regarding patient safety. RNAO’s Mind the Safety Gap Report analyzes health system priorities (based on the recently introduced Bill 210 – Patients First Act ) and compares them to nursing human resource trends and the evidence on organizational models of nursing care delivery.The findings are shocking. Current nursing human resource trends are at odds with the government's proposed health system transformation efforts, population health needs and evidence. Although the Ministry of Health and Long-Term Care (MOHTLC) says it has a bold vision for the health system, a provincial interprofessional health human resource plan to help make it happen is missing. Without it, organizations are resorting to misguided cost-saving measures, such as replacing RNs with less qualified providers and/or adopting fragmented organizational models of nursing care delivery. These decisions destabilize the nursing workforce and put the safety of Ontarians at risk. 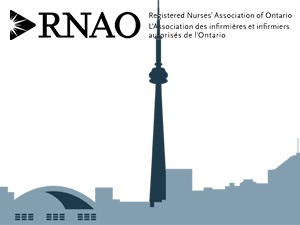 A report on the country’s nursing workforce by the Canadian Institute for Health Information (CIHI) confirms what RNAO has been saying for years: Ontario is in desperate need of more RNs . RNAO calculations based on CIHI’s figures place Ontario at the bottom – with the worst RN- to- population ratio in Canada. Ontario has 711 RNs per 100,000 people compared to the national average of 841 RNs per 100,000 people. CIHI’s data reinforces RNAO’s Mind the Safety Gap Report and the need to #StopRNreplacement.